Freshwater fishing on the River Stour is strictly seasonal. There is no fishing allowed during the Close Season (15 March – 15 June). Maximum penalty £50,000. Anyone over 12 years of age must possess a valid rod licence issued by the Environment Agency. This must be available for inspection at all times whilst fishing otherwise prosecution may result. Maximum penalty £2,500. These guiding principles are aimed at sustaining fish stocks, protecting the environment and ensuring the health, safety and well-being of all river users, including anglers. DO return all fish unharmed to the river as quickly as possible. The use of keepnets to temporarily retain your catch – though not prohibited – is not encouraged. Fish removal can harm the natural balance of the river ecosystem and can add to the pressure that some threatened species are already under. DO use un-hooking mats when specimen fish are banked: unhooking is the aspect of fishing where fish are most likely to sustain damage. Fish care is vital from the moment you begin to land the fish through to its safe return to the river. Fish that are well looked after out of the water should grow, and reproduce, well in the water. DO NOT use crayfish of any species, whether alive or dead, (including any part of a crayfish) as bait. Native crayfish are rare and protected. Non-native crayfish species can spread crayfish plague, which can wipe out the native species. DO NOT take any fish for use as live bait unless the fish are retained at and used only in the water from which they were taken. Moving live baits between waters can spread fish diseases. Live-baiting, though not prohibited, is discouraged. DO NOT leave a rod and line with its bait or hook in the water, such that you are unable to take sufficient control of the rod. DO NOT block or otherwise obstruct riverside paths and cycle-ways. DO NOT light any fires on or close to the riverbank. DO be aware of other river users. Always take care when casting. DO keep a careful look out for overhead electric power lines and keep a safe distance away. DO follow the Check, Clean, Dry advice to prevent the spread of invasive species. DO report all instances of unauthorised angling, dead or distressed fish or incidents of pollution to the Environment Agency’s EA incident hotline on: 0800 80 70 60. DO take all litter home with you. To fish the River Stour in Canterbury you need a fishing rod licence. Children under 12 don’t need a licence. However, if you take a child under 12 fishing and hold the rod or help hold it you must buy a licence for yourself. You must always carry your rod licence when you’re fishing or you could be prosecuted. 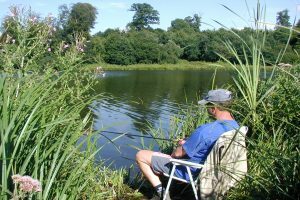 If you are coarse fishing with three or four rods (four is the maximum allowed) then you will need to purchase a second licence. All the income received from rod licence sales is invested into maintaining, improving and developing fisheries. You can be fined up to £2,500 for fishing without a rod licence. Under the salmon and Freshwater Fisheries Act, 1975 it is an offence to fish for coarse fish species between March 15th and June 15th (inclusive) on the River Stour. The ‘Close Season’ aims to protect fish stocks from the impacts of angling during the fish breeding season. MAXIMUM PENALTY £50,000. If you see anyone fishing out of season call the EA incident hotline on: 0800 80 70 60. Every year cases are reported of angling equipment contacting overhead electric power lines. Some have resulted in horrific burn injuries and even death. With the increasing development of fishing rods and poles, there is a risk of accidental contact with overhead electric power lines. Overhead electric power lines are difficult to see at night and against a dark or light background. Lethal electric currents can pass through almost all fishing rods and poles. Overhead electric power lines are often uninsulated (bare) and can carry high voltages. Overhead electric power lines on wood poles often look like telephone wires. Keep a careful look out for overhead electric power lines and keep away. Observe warning signs and instructions even in the car park or roadside. Unpack, set up and put away your rod or pole at the waters edge. Report any dangerous situation or near miss to the local electricity company.